This time round, although the field and time of day were the same, the wind had shifted to the South. Cool, smooth and very light. It would be a good test of the lower end of the 3 Skewer A Frame kite's wind range! On the downwind side of the field, leaves were barely ruffled in the tree tops. With only a few meters of line out, the kite just sank out every time after short tows into the air. Perhaps I had overdone it when shifting the towing point back... So I edged the knot forward just a little and tried again with more line let out. 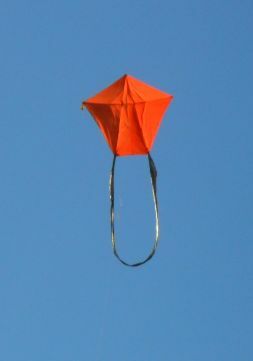 This time the kite climbed more willingly, and found just enough air to hang up there at a modest 25 degrees or so of line angle. Anyway, it did provide an opportunity to snap off a few photos. Also, a couple of videos. I always take more than one these days in case the camera focuses on something other than the kite! It's happened before. It was a rather slow climb, with the kite gradually heading out along the line of sight. Hence the line length was increasing somewhat faster than the altitude of the bright orange kite. Never-the-less, after quite a few minutes there were signs of faster air. Only slightly faster, but enough to power the kite up over 50 degrees of line angle. That was more like it! Finally, at around 300 feet above ground, there was a constant pull on the line. But nothing a 4 year-old child couldn't handle. The wooden winder slipped slowly across the grass when I put it down, just out of curiosity. And this kite is nearly 1m (3 feet) across! The weight of my kite bag with another winder inside plus hat, tapes and so on easily held the winder firm against the ground. The 3 Skewer A frame kite was barely moving as it responded to tiny changes in the direction and speed of the breeze. Looped tail flowing out behind, and twisting just a little here and there. But the air was remarkably smooth, compared to the usual inland turbulence we get, being several kilometers from the sea. At this point, just over 120m (400 feet) of line was out. Several small children appeared and one of them excitedly pointed up to the small orange dot in the sky, with the black plastic tail barely visible. Not long after that I checked the time on the digital camera, before starting to take the kite down. It was an easy job today with only light tension in the line. The Windtronic wind meter would surely record some very low figures... It sure did, at a max gust strength of 3.8 kph at ground level and an average wind speed of just 0.3 kph! Perhaps the kite was experiencing around 4 to 5 kph up there at 300+ feet. It was certainly the recipe for a very pleasant flight with no dramas.